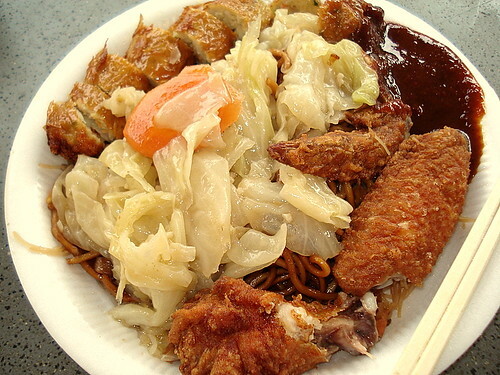 Fried beehoon mee plus crispy fried chicken wing, cabbage and ngoh hiang, originally uploaded by Camemberu. Finally a journey to the West! Got the chance to come to Eng Kee today, it's a humble little joint lauded for its fried beehoon and accompaniments. Indeed the stall was so humble-looking, non-descript and tucked away in a corner of a quaint old coffeeshop that I almost thought it was closed and abandoned. There was not a lot on display, maybe they had just started putting items out (I was there shortly after they opened). The beehoon was quite plain, the noodles (mee) a little better flavoured, originally uploaded by Camemberu. 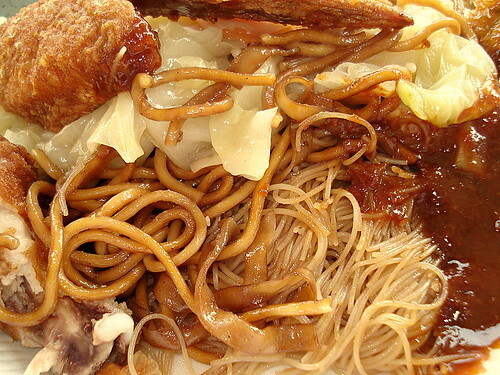 Fried beehoon/mee is commonly breakfast fare but this stall only opens from 4pm onwards. The beehoon is rather plain, not terribly tasty and certainly didn't have any bean sprouts as touted in some eating guide. It's not as good as the one at the old Holland Village food centre, which cooks its beehoon in flavourful stock. The mee is just slightly better and more peppery. The sambal chili sauce is very critical in this dish, often the saviour of these dishes. Here it is just slightly above average. The ngoh hiang (five-spice fried vegetarian sausage roll?) is okay, decent. 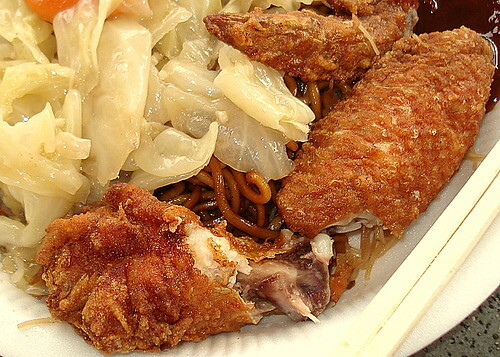 Crispy Fried Chicken Wing, originally uploaded by Camemberu. The real STAR here was the crispy fried chicken wing. Piping hot, with crunchy skin and plump, juicy flesh. Now this, I would pack home by the dozen! A very happy discovery. If KFC could do chicken like this, they'd be on my speed-dial permanently. Come to think of it, I've never eaten anything else but their chicken wings. I've tried the otak once I think. Wah so fast you comment, I'm still editing leh! lol :P Yes, their chicken wings are fantastic - but how did you know to only eat that? 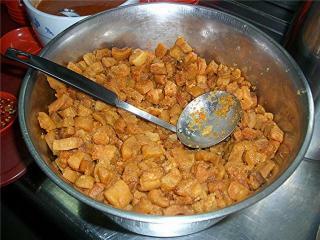 The luncheon meat also looks very well-fried, like it has a crispy shell. Hey came across your blog and saw that you have posted an entry on one of my supper places.... I guess only the chicken wings there are worth mentioning,i have to agree with you. Try the variety at Margaret Drive Food Centre nearby instead....especially the char kway teow, chicken rice and wester food...if you are in the area next time! Hi Bottomless! Yes, I'm trying to cover more places in the West as well. Margaret Drive is not bad - I have done a post on the chicken rice and spring rolls there. The char kway teow is not bad (but the queue!) Western BBQ also good. one of my favourite "keng chey" beehoon place. yes its the chicken wings. Southernoise, erm, sorry but what is "keng chey"?